You might have seen Claudia de la Torre and Hannes Gruber once or twice at night behind the ACUD bar. In the daytime both of them publish books and do art. This month they will present their latest work at Acud Galerie. It’s also Hannes farewell as bar manager. So please join us this Saturday to celebrate a new exhibition, life and friends. Opening this Saturday, March 23, 19H. Hannes and Claudia, you are now joining forces for an exhibition at the Galerie. We are looking forward to it a lot. 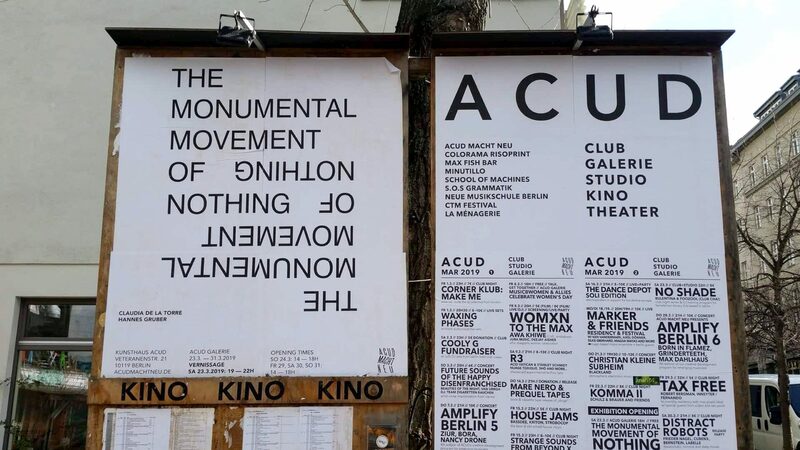 What is “The Monumental Movement of Nothing” about? Claudia, you’re gonna present a new installation produced in Mexico, right? Hannes: It’s not what it is about, thats the point! We didn’t work on a concept together, it’s more that we appreciate the work of each other and we trusted in doing a good exhibition together. I would say, we are although both not artist who wanna do big gestures, or in my case I am often imitating them, but they are empty or pathetic. Claudia: For the show at ACUD Galerie I am showing “Variations for Tokonoma Alcoves”, an installation I produced while doing a residency in Queretaro, a city three hours away from in Mexico City. Influenced by the idea of the Tokonomas in Japan as well as the use of variable space and colour I wanted to experiment with a new medium. I learned enamelling. Working with this technique, takes a lot of patience and time. Actually it is the opposite of how I usually work. Imagine this: you got a copper plate which you got to burn, then clean and polish. Then it’s ready to work on it. A layer of enamel (which is basically powdered glass) must be carefully and evenly applied using a metal screen until the plate is covered, about three times. Afterwards the plate has to go into a 800 degree kiln for three minutes until the glass fuses. When it goes out the glass solidifies. The last step is to clean again the plate and polish the edges. For each colour you got to repeat this steps. So in this installation I am mixing quick-produced photocopied images, alongside this long-process based enamelled plates inside of a variable grid system which will be presented as a floor-piece. Hannes, you can’t leave! But ok, your new home Mysliwska is fortunately not so far. Can you share with us your most fav Acud moment? Hannes: It really feels unreal to leave Acud! I love the place and the people involved in it, but it was time for me to start a own business again and I got this great opportunity to be part of the bar Mysliwska in Kreuzberg. My dream is, that we stay connected and Acud macht Neu will do some Satellite-event there and I still do events in Acud, so lets see. About my favorite moment in Acud: Hard to tell, I loved the summers and the courtyard with its weird architecture and sometime there is such a atmosphere when the whole house is busy, it feels like the world is ours and its great! I saw some great shows like FAKA or the fabulous DJ Marcelle. Claudia, you have traveled the world in the last years. Do you have some nice upcoming projects with your own publishing project backbone books? Claudia: I actually do! backbonebooks is part of my, artistic practice. Being a visual artist and publisher connect and interact with each other. Next week I fly to France to give a workshop on books to students of the Ecole Supérieure des Beaux-Arts de Nîmes. One week after I open a solo show in Pförtnerhaus, a space in Freiburg, there I’ll present “Alpina” an edition I published last year. And in May I take part in several shows. The first one in collaboration with a collective I am part of, I II II. And the next takes me back to France again, to present “A is not the same as B+A” as part of the Biennial for young contemporary art in Mulhouse. Oh! And If in Berlin, don’t forget to visit me and my publications in MISS READ: The Berlin Art Book Fair 2019 which will take place on May 3rd to 5th at Haus der Kulturen der Welt.